Animated Minotaur by Calciumtrice, usable under Creative Commons Attribution 3.0 license. 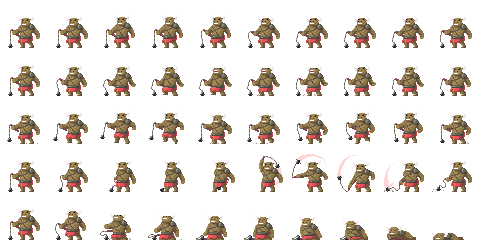 Hey, I have enjoyed your sprites, and love seeing stuff in a consistent style. I used them to mess around with MIT's scratch, and made a mini-game. I hope we can someday bribe you to make more of these, and more tilesets for it too.